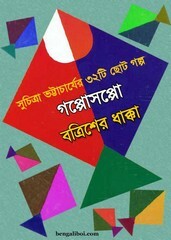 'Gopposoppo Botrisher Dhakka' is a collection of short stories ebook of this author. Not one or two there are thirty-two stories in this book. Ghosts, laughs, thief- no one is left out of this big list. There is mystery thriller story too. Collect this wonderful book as a pdf file and if you like these stories then try to collect an original hard copy from bookstore. The ebook has 251 quality pages, 14mb file size.